This is from the April 13, 2006 program. Libby's latest court filings name Karl Rove and Ari Fleischer as people who were also involved in leaking the information about Valerie Plame to the press. In Ari Fleischer's grand jury testimony, he describes a day when Scooter Libby took him to lunch, which had never happened before, and Scooter told him that Joseph Wilson's wife was a CIA agent, and that it was not widely known. (wink wink) Ari said that he took that to mean that he should leak it to the press. 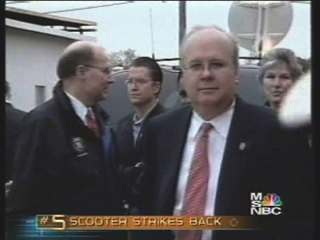 But the important part here is, of course, that Scooter has named Karl Rove as being involved in the conspiracy.